Wuala is a secure online storage solution like Dropbox or SpiderOak which comes with a cross-platform client (runs on Linux, Windows and Mac OSX and you can also launch it via its website, without installing the Wuala client, useful when you're not using your computer). 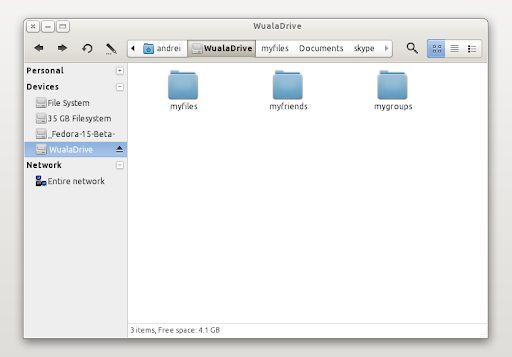 Why use Wuala if you already have Dropbox? Well, if you care about security, you'll be glad to know that Wuala encrypts the data on your computer so no one can see your private data, not even Wuala employees. Which is something that Dropbox lacks. But it's not only that! Update June, 2011: Automatic backup, sync, file versioning and travel, which were previously PRO features are now free for everyone. With Wuala, you start with 1 GB of free storage space. You can get up to 3 GB of additional space by referring friends or you can buy more. If you don't want to pay for extra storage, you can also trade space. 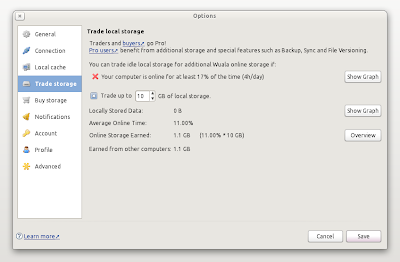 To be able to trade space, your computer must be online at least 4 hours a day. The amount of storage you earn depends upon your connection and is calculated by multiplying your traded local storage with the time your computer is online per day (%). There's one downside to Wuala: by default, you don't get automatic sync and file versioning, this being a PRO feature. However, you can become a Wuala PRO even without paying: all users who trade storage become PRO users. By becoming a Wuala Pro, you also get more extra space by referring your friends: 500 mb per friend you invite to Wuala (up to 6 GB of extra storage). If you decide to give Wuala a try and use Ubuntu 11.04, make sure you whitelist Wuala so it shows up in your systray. 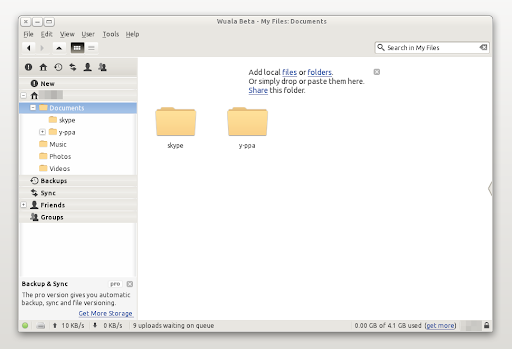 Installing the Wuala Ubuntu .deb will also add the Wuala repository so you'll get updates when new versions are released. Tip: By using BigRZA's (the WebUpd8 reader who sent us the Wuala tip) referral link, you can get 1 GB of extra storage space when you sign up. Thanks to BigRZA for the Wuala tip and Daniel for the Wired.com link!